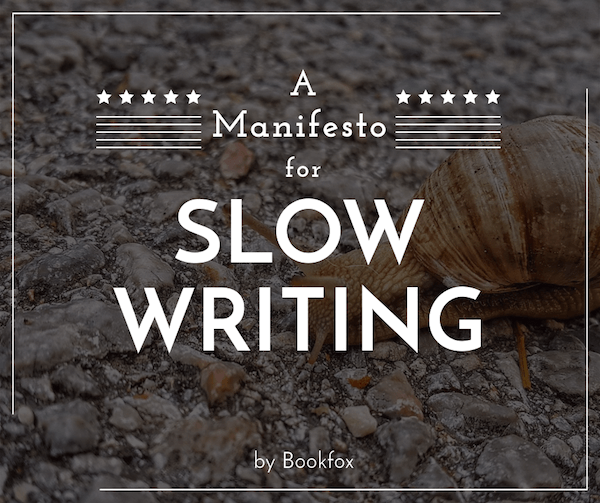 These principles about slowness can be transferred to the writing world as well. There are specific areas unique to slow writing that will make us better, wiser, and more fulfilled writers. Below I’ve written a manifesto for slow writers. I encourage you to read it, and if you agree, sign your name in the comments section below (if you won’t sign it, please say why in the comments). The time for haste is over. Embrace a more authentic way of writing and of being a writer. Despite being in a culture which prizes speed, and despite living in a capitalistic system that craves a production line of books, it is the mission of the slow writer to resist these traps and to cultivate a measured and thoughtful way of creation. 1. Resist the commercial pressure to pump out manuscripts at breakneck speed. The slow writer takes breaks between books to avoid repetition. They recharge themselves. Think of Marilynne Robinson’s 20 year gap between writing Housekeeping and Gilead. She took that time to educate herself and enrich her mind so that she had an abundance to offer the reader. Everything in the writing industry pushes the writer forward at a quicker and quicker pace, and this machinery must be actively resisted. 2. Know it’s not about the completion of a project but about becoming a certain type of person. The writer is successful if they can attune themselves to a certain kind of consciousness. The project-based method for writing is one that will only end in unhappiness. Slow writing is about being, not completing. 3. Resist the enchantment of the internet. The internet is the fastest machine ever invented. It delivers bursts of dopamine faster than a machine gun. That speed is at odds with cultivating a rich inner life. That is not to say that slow writers can’t use the internet, but only that we have to resist its charms and avoid letting our brain be shaped by rat-a-tat dopamine bursts. The slow writer acknowledges that their best writing will come during periods during which they limit or altogether forego internet usage. 4. Seek to build up the local writing community. With readings, workshops, conferences, writing groups. The slow writer is not placeless. Despite all the innovations of technology, you cannot replace a face-to-face meeting, a sense of community based on close proximity and shared geography. These communities require time to build and time to attend. 5. Practice Slow Reading. The slow reader knows that depth is more important than breadth. Don’t concentrate on how many books you read, concentrate on how deeply you delve into those books, and what you take from them. Every slow reader, no matter what they write, prizes poetry. Poetry reading is the antithesis of speed — it requires you to slow down, and to chew every line and every word. 6. Believe that everything deserves our close attention. David Foster Wallace has written a lot about how attention is one of the essential traits for a writer, and if we’re writing too quickly, we’re not truly paying attention. DFW: “The really important kind of freedom involves attention.” To him, nothing can ever be boring because everything is worth your attention, and close attention will pay dividends on anything you study. The slow writer must nurture a deep sense of thoughtfulness and inquiry. 7. Never network. Networking is based on speed — speed of friendships, as a means to speed up your career. Through an acceleration of relationships with strangers, it’s hoped they can give you an advantage in your career. But this treating people with haste is antithetical to the slow writer creed. The slow writer creates friendships, not networks. Slow writing is about relationships that are non-utilitarian, with both those who can help them and ones who cannot. 8. Create roadblocks for our writing process. For some writers such as Wendell Berry, this means avoiding the all-powerful computer and instead choosing to write in longhand precisely because it is slower. For other writers it means writing on a typewriter because this slows the pace. For other writers it might be using a timer to take regular breaks. Although the methodology can change, the underlying truth remains the same: speed is not the ultimate virtue, and deliberately slowing oneself has innumerable benefits for your writing. 9. Respect language — all its possibilities, history, and connotations. It is the fast writer who uses language in a utilitarian manner. The slow writer prizes the texture of language, and all the richness that creates language. This simply takes time to pay attention to — a living web of linguistic play and innovation doesn’t happen by accident or at race-car speed. An excuse to dawdle. Slow writing is not laziness. It is not an excuse for why you’ve been working on that manuscript for a decade. It is not a reason to not be diligent. If fact, slow writers often work harder, because they are constantly attending to their work. An easier route. In almost all cases, moving methodically and thoughtfully through your scenes and your subjects requires much more attention and effort. The slow writer must attend to their writing, to attend to the world and characters, and that requires a great deal of them. An invitation to endlessly research. Research can be a bear trap for writers, sucking up thousands of hours that are not spent writing, and some get caught and never escape. An automatic condemnation of gimmicks like NaNoWriMo. Brief periods of quick writing can be useful tools to jolt one out of a rut or as an educational device, but they should never be confused with thoughtful writing. There is no substitute for care and attention. Many thanks to Elizabeth Dark for holding a discussion group on this topic at the FFW conference — her thoughts and insights were valuable. If you believe wholeheartedly in this manifesto, and if you pledge to live according to its principles, please sign your name below in the comments. Want to read more about slow writing? Love this … mostly because it validated my own slow writing method, at a time when there is a lot of pressure to just “get it done” and published, despite the quality. I guess I’m a quality person. I don’t want to put anything out there, with my name on it, that hasn’t been well thought out and well written. This isn’t to say a work has to be perfect before publishing … just something I can be proud of! What’s interesting about this article is that I was just thinking this morning about how rushed I have felt with my writing projects. First you’ve got to hurry up and write the book, then you’ve got to hurry up and market it to make sure it sells. It’s hurry up, hurry up, hurry up! Well, I’m tired of rushing everything and trying to meet deadlines because the more quickly I try to meet them, the more mistakes I make. Thanks so much for this manifesto, which allows more grace to us writers instead of pushing us to compete with one another. Thank you for this article. I am currently writing a romance novel that is sexually highly charged. I am almost at the 80,000-word mark and I have deliberately slowed. I do not plot my work, but I am a dedicated panster and I travel the lives of my characters, with twists and turns at every conceivable opportunity. I do use the computer as searching online dictionaries and thesauruses a Godsend. I also play silly games and listen to music. Music is a must-have when I write, as that helps me concentrate and often a character will fill the score perfectly. Once again, thank you for this and all of the advice you give. This is tremendous. I’m in. There must be something in the air because I just wrote about this on my blog! Here, here! Oh, can you link to it? That would be great. 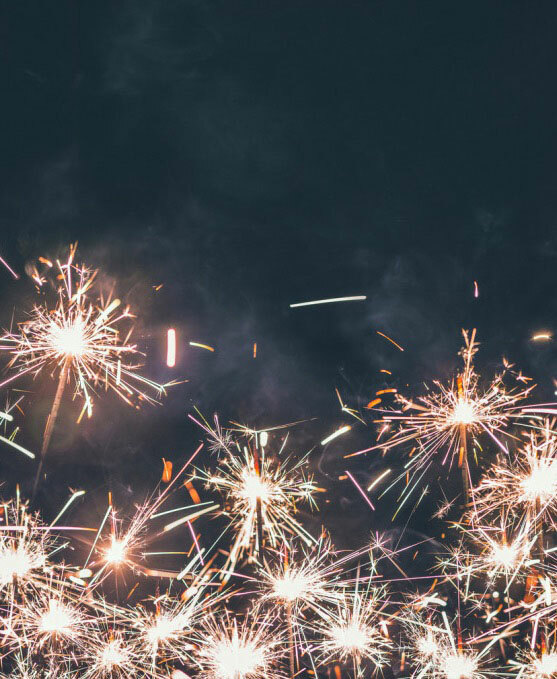 This article caught my eye becuse retiring from public life and working on my new novel, I found that there was no longer any need to pressurise myself to get certain things done. The first thing to go was the alarm clock. I like silence and I don’t wear a watch…But the most important thing is, I decided to edit as I write, so that when I get to the last period in the book, it is a complete work with no further editing required. I started this novella about three months ago and I’m only half way through, and I’m pleased with the results, for I’ve always maintained, writing is a craft no different to any other art form. Patience and careful consideration is the key to creating the best work you can. 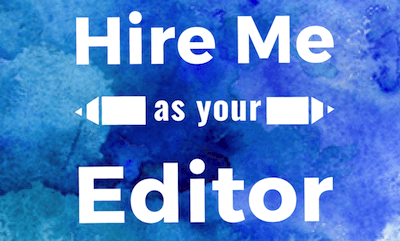 A writer who edits their own work has a fool for an editor. Good ideas here. I write slowly because (1) I think slowly and (2) I want to turn out something that stands a chance of publication. Fast does not mean good. It takes me a year to write a short story, and then I have to polish it. I love writing things where style of language is the main focus, along with the story. I would add another point – Quality not quantity. An that takes slow writing to make sure your words are working well. Excellent! Thank you for writing about this. It inspires me in many ways. Signing my name! This has been my natural method of writing all along! Mine too. But researching was beginning to take some of my time needlessly. Culitivating personal awareness is a golden activity. Being aware of one’s self in all of its connotations allows for a more stable and fulfilling life. And I seriously envy those who can write cogently, richly and informatively to enrich the reader. A truly wonderful gift and talent. I love the phrase “aggressively patient.” That’s just brilliant. There is always a strong tension between quality and speed, and how often they’re inversely related. I think this is the very answer to our problems as writers and human beings and for those who do not hold with evil capitalist philosophy! Now, now, there is plenty that is fantastic about capitalism. It’s not a perfect system, but it’s lots better than many other economic systems. But that doesn’t mean we can’t critique the flaws, and the commodification of our art is always something to watch out for. In general, I fully agree. In specific, there are times that I deliberately write as fast as possible (usually on the computer, because it’s faster than handwritten), ans those are the times that I have an idea, and I want to capture it before I lose it. If I try going slow on that, I end up losing it, and can’t recapture it. Yes! This was my point with the NaNoWriMo. Writing quickly can be very useful as an exercise and as a tool, but the trouble is that so many people end up believing that’s what writing should look like all the time! I wish I had this article to read 10 years ago when I started outlining my first manuscript! I have to say that I get caught up in long hours of research due to the stories I like to write. After almost 10 years of many edits and changes on that manuscript, I’m finally about to be published! While I wait to find out the specifics, I’m working on my next story! Now that I have read this awesome article, I will practice SLOW WRITING and I will NOT get caught up in too many hours of research! In fact, I may try to go to the library and research from actual books and keep the internet for stuff I can’t find in books! This is most comforting. Helpful and hopeful. Sometimes I quit because I think I’m too slow and often write longhand in a comp book. Never even considered NaNoWriMo; could not see the point. Thank you for clarifying this encompassing societal and social issue, and making this world–including the writing world–just a little bit gentler for me. Melissa Compton, I read slow so it makes perfect sense to me write slow too, this sounds like the perfect approach to me. Yes, slow reading and slow writing are definitely linked! I second (third, fourth…) so many of these comments. I too take a year to write a short story (as I polish away at other more finished ones along the way). I hover between hope and despair although hope always wins because the pleasure in the process itself drives me on. I think the rage and pressure within us to go faster also relates to the urge to be read: to be acknowledged and understood. But first and foremost, we need to be our own best reader, connecting with our truest self in order to ultimately connect with others ‘out there’ who may one day read our work. Long live the right word in the right place! 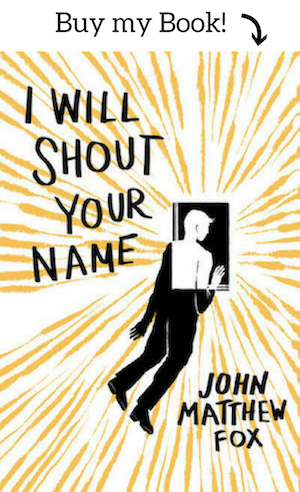 Thank you so much, John – I feel less alone – and look forward to reading I Will Shout Your Name – slowly and I am sure with great pleasure! There is a distinction between writing for pleasure, and writing for profit. Each satisfies their own medium- the one languorously literate , the other crisp and contained. That is the way of things. Can you write for pleasure quickly? Can you write for profit slowly? Thanks for the encouragement. I have been gradually slowing myself down. The novel I’m working on now I whipped out in two months ten years ago and I immediately sent it out into the world. Surprisingly, I landed an agent quickly, but not knowing the publishing industry very well, I got impatient and self-published. It’s just as well. I’m working on its fourth version now, which will be much better than any that have gone before. And I’m taking it easy, not rushing, and choosing each phrase – each word – carefully. Love this story. Even with great success, you decided to slow down and take more time. What a fantastic changing of priorities and approach. I appreciate the idea behind this article. Its not about how quickly, how aggressively you can write. Its the material in which you can create that makes the difference. I’m a wife and mother of two and get little time to myself to actually write. I find that when I finally get the opportunity, what I write is profoundly better than when I try to force myself to. It comes down to effective time management and taking advantage of the moments your brain tells you something. I think writers need to stop and observe before they can write what they see. Also, the only competition should be within yourself. Last, allowing time and space, to water and tend your words, gives a more beautiful garden for others to appreciate. I have always charged by the word or the page and never by the hour because my writing process can be very slow. If a 1-page article takes me 20 hours to write, I will not charge more than a 1-page article that only takes me 6 hours to write. My writing process requires the right frame of mind and that can’t be conjured up at will. I’m presently completing a romantic erotica novel that I began 3 years ago. I write a chapter on the computer, then I read and re-read it on the screen, and make changes. Then I print it up and re-read it on paper (inevitably finding all kinds of things I didn’t notice on the laptop screen), mark up the paper, apply all the changes, and repeat the process. It’s laborious but thorough. And whenever I skip a step to hurry and finish, I regret it. God bless this manifesto. Love this process that deliberately slows you down. It’s a great idea to switch between print and the screen and back again. I agree with Lyle. Faster books aren’t better books. I think that writing is better when it’s well thought out. That’s not something you can do overnight. I’ve done my best edits when I’ve taken a step back from my work and read it tho see whay I’ve left out and what can be better. As I get older, there’s an underlying sense of urgency to be acknowledged, to be published, and to be accepted amongst my peers is always present but, I have found that ‘pen to paper’ works best for me because it slows me down. It’s in that ‘slowness’ that allows the right word to evolve within a sentence, a short story, or novel. I was the first person to purchase a recently published book by my sister and I couldn’t believe that a publisher would actually print something so atrocious in regards to sentence structure, punctuation, and form. It reads like a rough draft that was never edited. I won’t ever hurry through whatever I am writing or submitting just because of a time constraint that I have put on myself. 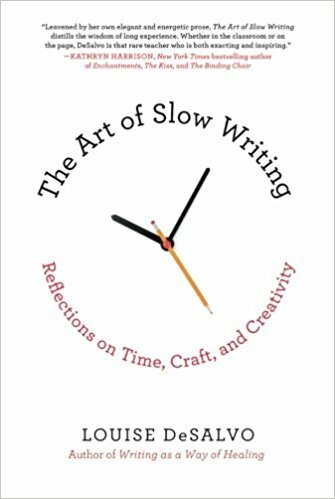 Wow, I find this article and the whole concept of writing slow absolutely wonderful. When I first started out taking writing courses 27 years ago, the advice given was that once you get your first work published, you have to pump out more work fast or your publisher will drop you and your reputation will be destroyed and you’ll never publish again. As a very new mother who went on to have six children, I knew I could never write fast enough to keep a publisher happy as my husband and children came first. So this article gives permission to write slow but still write. Awesome. Count me in. Totally. Thank you, John! Wish I’d heard this advice 27 years ago, I may not have kept my foot on the brake for so long. I am a novice and writing is new to me. The advice given quality first and speed second is the right action to take. Yes, still have the original hand-written version of all three of my published books, and the fourth in process…going on six years on this one! I agree with the manifesto, in principle, but must confess, part of me longs to be churning and earning! Cannot agree more. Felt an incredible pressure to produce work after graduating from art school two years ago. I remember being told before I left; ‘people will only take notice of you after art school if you continue producing work and exhibiting within the first three years after’. All sorts of obstacles have gotten in my way to completing work within this three year deadline. Then, I guess, the question arises – do people disregard art that they enjoy because it’s not within those 3 years? I highly doubt so. People ask me now what I’m doing, and I inform that I’m keeping a writing journal (have done since 2015) and will collect my writings, be it poetry or short stories, and produce a titled piece next year. ‘You’re doing that for a year? !’ they say. Yes, yes I am. I take much more enjoyment in doing things when I can take my time with it. I’m no novelist but I even find myself rereading and editing works I publicly published 4 years ago – which I publicly published in haste. Hi there! This process seems like an amazing way to just slow everything down and think for a moment. I’m not much of an author, but I think it would be intriguing to try this. Thank you for the idea! So glad I took a minute to read this article. I am both a slow reader and a slow writer because I like to savor the parts I’m reading, and not just skim through and get the basic content. I want to receive the feeling of the passage. And it’s the way I want to write so that my readers will also take the time to savor what I have written. As for research, it is something that I find interesting and educational and it does at times feel like I should be writing instead, but the purpose is to write well and that means you must research well and if it takes time to do research before you can write well, (rather than write fast) that is the product I want my name attached to. I do commit to slow writing. I’ve always read slo so. At a very young age I noticed my sister could recite everything she read and I could not. However, I slowly evolved to recognizez that although I couldn’t remember word for word much of anything I read that I actually found something had happened inside me and I lliked that feeling of companionship. I was just a kid discovering that realization. Through the years myself’s companionship has enjoyed that “something that happens inside me’ and more recently my writing reflects that ‘something that happened inside me’. Do I dare say? Yep. Yes, yes and yes! Beautiful composition with insights so important and oh so true! I’ve been in a observe, ponder, observe, write, repeat mode and it’s deliciously satisfying and productive in a more meaningful way. I agree with your point–the deeper you go, the deeper you give, and that carefully cultivated depth makes great literature that can be transforming both for the writer and the reader. I just read a precious and inspiring children’s book, BE STILL, LIFE by Ohara Hale which speaks to this very issue as it’s applied to daily living. How wonderful to share such important wisdom in such a lovely way! It’s that level of quality that I strive for in my writing, and will hopefully achieve through slow and thoughtful progress. Thank you for this post, John! Hi there great article and sound advice. The world is too fast these days, slowing down is definitely something we should be doing more of, especially in our writing.